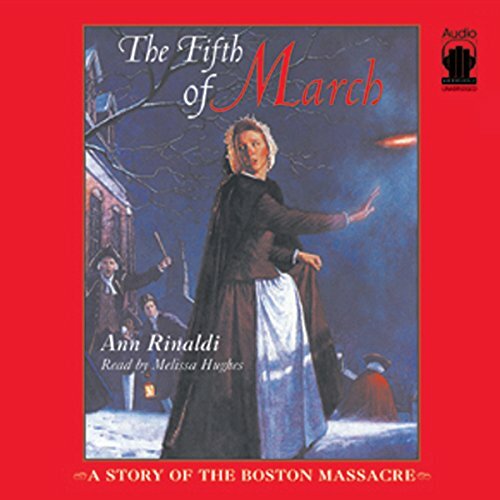 Fourteen-year-old Rachel Marsh is nanny to John and Abigail Adams' children and witnesses firsthand how tension builds in the feisty New England town in the two years before it erupts in the Boston Massacre. Friends become foes and families divide as British troops arrive in 1768 to force the outspoken Bostonians to toe the line and obey the British government. I enjoy reading period work and liked reading about the time in a fiction format. It wasn't a great piece but it passed the time. I found the language and the reader's pace to be a bit "stilted," which caused me to be removed from the story at times. In all, I would rate the book as an "okay" adventure of a young woman's journey from child to young adult and her intellectual revelations as a story I can identify with, however it was not much of an challenge. Somewhat worthwhile, in my opinion. Meh...I didn't like it very much. Historically flawed. Pretty boring and drawn out, considering the subject matter. We enjoyed listening to this story after doing a lengthy study on the Revolutionary War. This story is written from the view of the nanny for the Adams family. The story itself was really quite engaging and interesting, and the narrating wasn't terrible either. However, there were a few downsides, the biggest one being that the narrator didn't take a breath between the end of say one chapter and the start of another. It was read all most as a run on sentence! I found that slightly annoying, but not enough to stop listening to the book. Well researched, this is an account of the law, politics and society in Boston in the lead up to the 'massacre' that took place shortly before the outbreak of the American War of Independence, telling the story through the eyes of a young girl, an indentured servant to John Adams. The book though has significant drawbacks: there are long passages throughout the novel devoted to lead character's emotions as part of her growth into adulthood. These don't seem very realistic, and get in the way of what would otherwise have been an interesting book.